• If you use the Facebook for iPhone or Facebook for Android app, this is the feed you see — the Live Feed gusher, not the filtered Top News feed. • Does your Most Recent feed contain absolutely all of your friends’ updates? Well, it probably contains 98 percent of them. At the Daily Beast, Tom Weber conducted an experiment and found that updates, links, photos and videos posted by a Facebook newcomer did not appear in some of his friends’ Most Recent feeds. And others have noticed that the Most Recent feed doesn’t contain a few of the updates you see in the unfiltered Live Feed on your mobile device or a third-party app using an API like TweetDeck or Hootsuite. Try it — it’s an interesting experiment! • I should also mention that an update by a Facebook Group — as opposed to a Facebook Page or personal Profile — does not appear in either anyone’s Most Recent or Top News feeds. Groups may contact their members via in-box messaging up to a maximum of 5,000 members, which Pages cannot do. But today it’s almost always better for a brand to create a Page, rather than a Group, to maximize visibility within the News Feed. You may also want to check the settings found by clicking on the “Edit Options” button of your Most Recent feed at the top or bottom of the page. Now, here’s where it gets interesting. We don’t recommend turning your Top News into a Most Recent firehose. The idea behind Top News is this: You want to see news from the Facebook members, brands or causes that matter most to you. And we agree: You want to be selective about who to devote your attention to, especially if you have hundreds or thousands of friends and follow scores of Pages. Your time is valuable, right? So you need to teach Facebook’s Top News feed how to behave. And you want to set up lists for more targeted updates, which we’ll cover in part 2. Affinity: The more often you engage with content by a person or Page over time, the higher your affinity will be for that content creator. Weight: As posts are commented on, liked and shared by other Facebook users and their networks, their overall weight increases, even if you’re not connected with those users. A posting with 10 comments and 15 Likes carries a greater weight than one with no comments or Likes. Not all interactions are equal. A comment probably counts more than a Like does. Timeliness: The more recent the post, the higher it ranks. As time goes by, its value decreases. Top News will show you hours-old updates from some friends while ignoring newer posts from others. You probably wonder which of your friends see which of your posts. It comes down to this: A high EdgeRank leads to visibility while a low EdgeRank leads to obscurity. 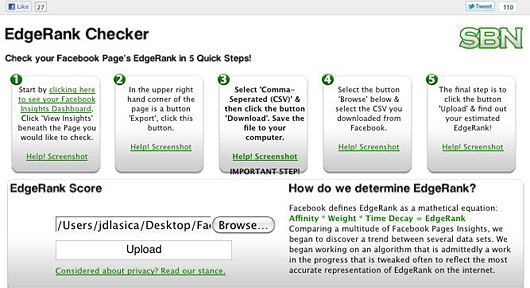 Last week social media strategist Mari Smith wrote about a new tool that measures your Facebook Page’s EdgeRank score. If you have a Facebook Page, EdgeRank Checker — pictured at top — steps you through the process of determining how effective your Page is in reaching your followers. No download necessary. Here’s how it works. Just log in as an administrator, go to your Insights page and select the Page you want to check (image above). Choose a date range, click the Export button and be sure to tab over to select CSV (not Excel). Then upload the CSV file to EdgeRank Checker and it spits out your score in a few seconds. The resulting page will show what your score means. Facebook expert Chad Wittman, founder of social media management firm SBN, created the tool. There’s also a fan engagement checker at Fangager.com – enter your Page username to get a full summary (hat tip to Brian Solis). The exact way EdgeRank works is part of Facebook’s secret sauce, but we’ll explore how to increase affinity and weight — that is, how to enhance your influence and visibility — in part 2 of this series. Thanks to Bryan Person of Liveworld for fact-checking and editing this series. Cross-posted to Socialmedia.biz.JD Lasica, founder and former editor of Socialbrite, is co-founder of Cruiseable. Contact JD or follow him on Twitter or Google Plus. An excellent "stuff to do' post for a Monday. I like it – a little bit of data, a little bit of stat work, interesting results and the feeling I've "done something" this morning! I found this insightful. I didnt know that you could import your Facebook Insights into EdgeRank Checker to get a detailed snapshot of your page reach. So interesting! I was definitely aware of the funcitonality and differnece of Top News and Recent Posts. I am using FanGager right now to analyze my Facebook page engagement. Hope it's a good score! Didn't know about FanGager, so thanks for sharing, Allison! As of May 3, 2011, EdgeRank Checker doesn't allow the option to upload the exported FB data any more… or at least not that I can find. Instead, you are invited to log-in on the FB button, and select the FB page you want to check.